While it’s common for long-time fans to think of the Disney purchase and subsequent continuity reboot as a big dividing line in the Star Wars franchise, what you might call the “modern” era of Star Wars actually began much earlier in the form of The Clone Wars. Blazing its own path between Episodes II and III, borrowing liberally from the Expanded Universe without adhering strictly to its details, TCW in retrospect is a perfect example of how modern Star Wars storytelling would come to operate. 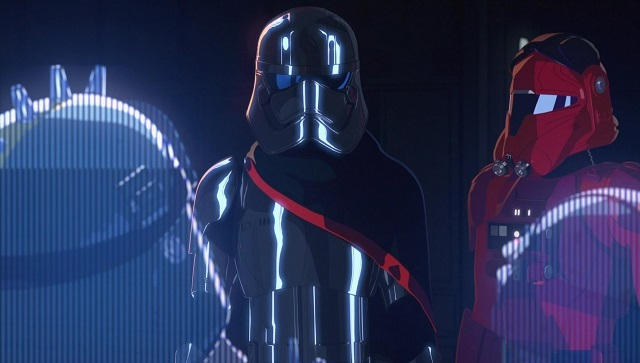 It’s also a great model for what future Star Wars animated television would look like—when Star Wars Rebels came along in 2014, despite being set deep into the Dark Times, some of its earliest episodes were lighthearted to the point of distraction. An entire episode revolved around stealing fruit. Sabine, only a little older than Ezra, could waltz into and out of Imperial facilities seemingly on a lark, with little apparent danger.1 Stormtroopers, even in death, were treated as jokes to a degree not seen on screen since Return of the Jedi, more akin to battle droids than truly lethal soldiers of an all-powerful Empire. Looking back, though, this tonal shock seems less about any reasonable expectation of what the show would be like (and on that fair minds can differ) and more about where The Clone Wars had left off. Like many animated shows, TCW started in a very simple place with a very limited library of assets, and its protagonist Ahsoka had all the innocence and whimsy of Ezra and Sabine put together. But over six seasons and forty-plus hours of material it became something very different, and infinitely more complex—not just artistically, though definitely that as well, but in terms of the “seriousness” of its storytelling. It’s easy to argue that Ahsoka’s existence strengthens not just Anakin’s arc but the prequel era as a whole, but the fact is you could excise her completely without losing a vital piece of the saga—if not, Revenge of the Sith wouldn’t have worked in 2005. But even people who don’t know about Ahsoka and don’t care to might very well wonder why the clones turned on the Jedi so easily, or how the whole “Force ghost” thing worked, or what happened to Sifo-Dyas, or how exactly Anakin was supposed to “Balance the Force”. For better or worse, the prequels left a lot of open questions, and in choosing to address them, TCW became a much more mature show. So it’s not surprising that barely six months after we got some of TCW’s most weighty, significant material, “Ezra and Zeb steal a cantaloupe” felt jarringly ephemeral.2 But just like TCW before it, Rebels‘ bleak setting gradually eroded its sense of fun (I mean that as a compliment) and resulted in a hardened but hopeful cast of characters managing to squeak out what in the grand scheme of things were a couple pretty minor victories. 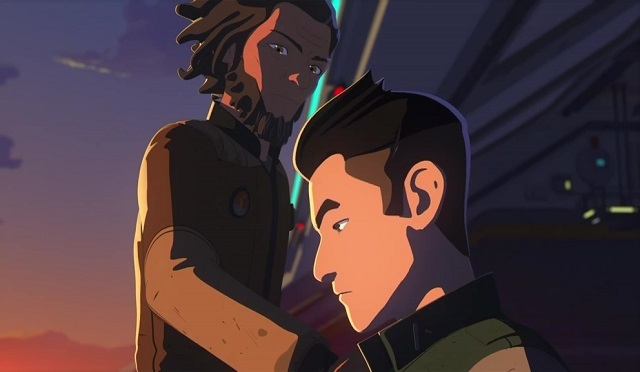 And now here we are again: three episodes into Star Wars Resistance, many are calling it the most youth-oriented canon series yet (though certainly it bears a lot of superficial similarities to The Freemaker Adventures). In the latest episode, “Fuel for the Fire”, two very clear high and low points are presented for the impulsive and naïve Kazuda Xiono: his poor work ethic leads to a series of problems for Jeager’s repair business, and thus his cover story, yet when a friend’s life is in jeopardy he doesn’t hesitate to literally leap into danger himself, even when that “friend” has done nothing but use him. For my money, Kaz is right in line with Ahsoka and Ezra—clearly exhibiting a lot of room for growth but with an obvious core of decency. Where he stands out, and this is perhaps one reason his show feels “younger” tonally, is that he’s several years older than his forebears, already an adult in everything but demeanor. Of course, he’s led a much more comfortable and sheltered life than either Ahsoka or Ezra—ironically, that Kaz’s generation could produce such a pure cinnamon roll is perhaps the ultimate evidence of the New Republic’s hard-won era of peace and prosperity. Peacetime can still breed soldiers, of course, but Kaz’s war is one of principle and personal pride rather than survival or necessity. As the son of a senator, he could have sat this whole thing out. But in choosing not to, he very likely saved his own life, and that’s where the story of Resistance gets much more interesting. One thing that makes the sequel era different from its predecessors is that prior to The Force Awakens it’s largely a cold war. In a franchise that relies so heavily on open, enthusiastic pew-pew that can be a tough context to work with, especially in a format aimed at an especially young audience. Yet already Resistance has shown an aptitude for working within those confines without undermining them. The first armed conflict we see occur over the Colossus is with pirates; that could be enough in and of itself, and that the pirates largely use old cobbled-together Imperial hardware could be nothing more than a fun aesthetic choice. But impressively, there’s more to it than that—the pirates are working at the behest of the First Order. We don’t have all the details yet but it appears likely that they’re after the station’s fuel reserves, and the pirates are meant to create a climate of insecurity that the First Order will then graciously offer to resolve with some hardware of their own. A protection racket, in other words. There are much less complex ways to use the First Order as antagonists in this era, up to and including ignoring the cold war altogether (it’s the Outer Rim, after all), so that Resistance is choosing to go this route speaks well of its ability to avoid painting in broad, simplistic strokes. Another clever use of the time period is Kaz’s mission as a spy—not to mention a great source of personal tension considering that he’s a hotshot fighter pilot through and through. Spy stories are a great way to extract maximum drama out of a minimum of open hostilities, but beyond even that, spy stories by their very nature involve some amount of betrayal. Only Jeager knows what Kaz is really up to, and it’s very likely not everyone will feel great about it when and if they learn the truth. A major subplot of the premiere, in fact, is Neeku’s near devastation over an innocent misunderstanding—imagine how he’ll feel when he learns what Kaz has truly been lying about. But that’s not all; while there’s no real evidence just yet I’d place good money on someone we’ve already met turning out to be not just sympathetic to the First Order but an actual operative akin to Kaz himself. 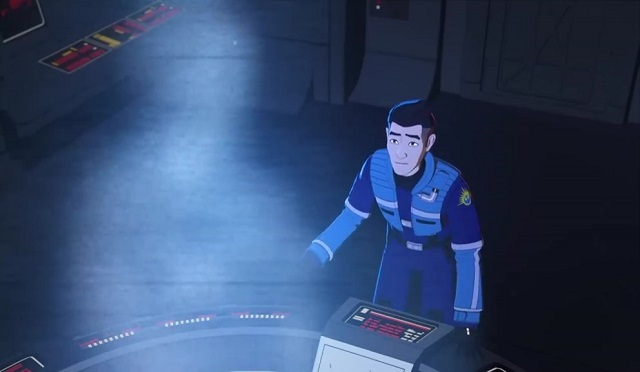 Imagine if after a season or so of Rebels had gone by we suddenly found out that Sabine was an Imperial agent all along, and what that would mean for the narrative. Then imagine if the Empire had blown up Lothal shortly afterward. That would have been one hell of a “kiddie show”, wouldn’t it? And that’s exactly the kind of story we seem to be stepping into here. Which brings me to my final point: the imminent destruction of Hosnian Prime and the decimation of the Resistance. Amusingly, each animated series has trafficked in this kind of dramatic irony to some degree—TCW is about a Jedi at the end of the Jedi and a friendly clone whose compatriots will soon be the bad guys, and Rebels is about a small cell who have no hope of being more than bit players in the Empire’s defeat. When the movies are telling the “main” story, this kind of thing is inevitable—but wow, Hosnian Prime is Kaz’s home planet? His father is its senator? They chose to do that? I don’t care how many wacky aliens are fooling around in the background, this is not some happy-go-lucky story. As I mentioned earlier, the protagonists of both Rebels and TCW had to settle for very limited victories—for the Ghost crew, a single planet, devastated but free, and for Ahsoka and Rex, nothing more than survival and independence. Unlike those stories, whose backdrops were already old news, we don’t actually know yet how the Resistance/First Order conflict will end, or what kind of “victory” the characters can hope to achieve. All we know is that things are about to get really, really bad for Kazuda Xiono. He and his TV show are going to have to grow up pretty damned quick.